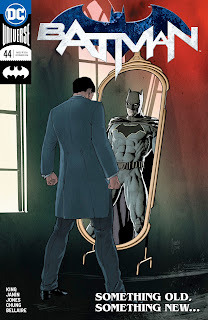 The bulk of Batman #44 sees Selina Kyle (alias Catwoman) picking out her wedding dress for the upcoming big day, but the big story is really in the interwoven flashbacks. At first glance, the flashbacks appear to be nothing more than a simple nod to past continuities. Juxtaposed with the present, it looks like King is acknowledging that all of Bruce and Selina's past together from the Golden Age through the Silver Age, the Bronze Age, and Modern Age all happened, leading them to where they are now. While it is natural to scratch one's head and ask "Huh? How is all of this still in continuity when both Crisis and Flashpoint flushed everything down various toilets?" Well, that appears to be the point King is making. All of it happened, but has been erased from the memories of everyone in the DC Universe, causing everyone to seemingly start over. Various characters (namely the Flashes) and now Batman are starting to become aware of this phenomenon, possibly leading up to (setting up for) Dr. Manhattan's reveal in Doomsday Clock. 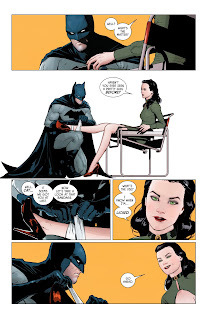 Within the pages of Batman #44 (in the two page spread) Bruce tries to communicate to Selina that they keep changing and it's more than just their outfits that keep changing. It's their entire history, their memories, and personalities that keep changing. Selina on the other hand doesn't know what he's talking about because what he's communicating isn't registering with her memories, effectively proving his point. The last time we saw Bruce and Selina have this conversation was in the "Rooftops" story arc in King's Batman where they also shared different memories of their first encounter. Bruce remembered their Golden Age meeting in Batman #1 (1940), but Selina remembers their post-Crisis encounter in Batman: Year One. So where is all of this going? Well it seems to be validating an earlier theory I had where Dr. Manhattan's manipulation of the DC Universe didn't start with Flashpoint or Crisis on Infinite Earths, but at the start of the DC Universe itself with Action Comics #1 in 1938. So far, Doomsday Clock #2 has teased this idea when Ozymandias noted how many super powered people exist on this Earth and New Rorschach speculated that "maybe Dr. Manhattan created some of them." My feelings on how Watchmen is being used aside (I'll save that discussion for another day), it looks like Dr. Manhattan is going to be the explanation Johns uses for how the DC Universe was conceived in the Golden Age, how this led to this universe being split into Earths 1 and 2 (effectively establishing a multiverse), what led to that multiverse's initial collapse and rebirth as a single Earth, and how he kept doing this over and over again, possibly as a way of understanding human beings. If all the changes DC has undergone throughout the decades has been the product of experimentation, what does this mean for the future of the DC Universe characters? Are the Prime Earth Bruce and Selina really getting married for their first time in their respective history, or are they actually reclaiming their pre-Crisis Earth-2 history? What does this mean for the future of Bruce and Selina's daughter, Helena Wayne? Will this result in the return of the original Huntress who is also Power Girl's best friend and member of the Justice Society? Will this Huntress turn out to be the Helena Wayne we met in the New 52? Will this Helena Wayne still turn out to be the pre-Crisis incarnation who also existed as the post-Crisis Helena Bertinelli? Will the endgame result in her being integrated into the Prime Earth universe? What will this mean for her best friend, Power Girl? So many questions, and we're only barely touching the borders of the answers. What does everyone else think? Well, Helena will probbably be back as a Prime Earth character.